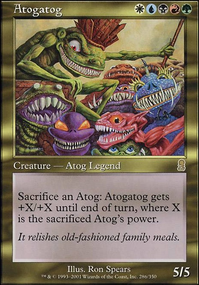 Atogatog aristocrats deck using the atogs for sac outlets. Most everything else either ETBs/LTBs for value or returns things. Mana: everything that produces or accelerates or fixes mana. Atog: all the actual Atogs. Conversion: these cause things to be another thing. Rise: things that bring stuff back from the graveyard. Fodder: things that die for value. Card-Advantage: draw cards or search for cards. Removal: deny opponent's their resources. Fling: all the fling effects.